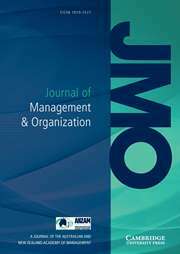 Journal of Management & Organization (JMO) is an international, peer reviewed journal offering high quality research across the management discipline. It aims to provide global perspectives on management and organizations of benefit to scholars, educators, students, practitioners, policy-makers and consultants worldwide and welcomes contributions across the management, sociology, psychology and political science areas of research. JMO invites hard hitting and controversial contributions on current or relevant topics but must be supported by good, empirical research. JMO is the journal of the Australian and New Zealand Academy of Management .